Review: I really enjoyed this one! The way the story was told unconventionally through documents, interviews etc. is such a cool reading experience. If you liked the style of writing I recommend House of Leaves by Mark Z. Danielewski. Characters – You don’t get much of a description of these characters as its told through others POVs through different types of media. There is also only a few key characters in the novel. Ones that are mentioned the most with a different name thrown around here and there. I liked Ezra. Did not particularly like Kady. She seemed too full of herself. AIDAN was annoying. World – It took place on multiple space ships. It did start off on a planet but there really wasn’t much of a description of it. I feel like I couldn’t really visualise it nor do I particularly remember and description given. Plot – Super cool. AI and a virus in space in the future? Also the twists? MAN. Got me good. Cover/Pages – There was some really beautiful pages within the book. Nebulas with the sentences interspersed it was cool. I downgraded my rating from a 5 to a 4 as I had a week to fully process the experience. Would you find a format like this confusing or really cool? 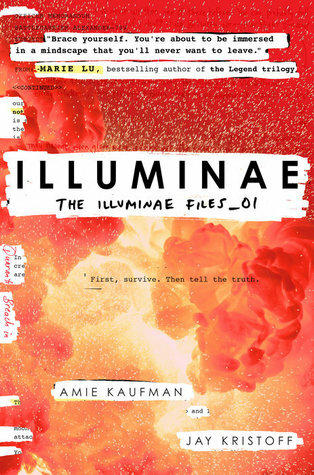 This entry was posted in book review, illuminae. Bookmark the permalink. I keep hearing great things about this book! I might have to give it a try! For me, a format like this might be weird and/or even boring, but I'm always willing to open up for new things! Also, this is set in space? Well, I clearly read that synopsis a long time ago because I did not remember that but sounds great! Let's see if I get to get my hands on this one some day, and hopefully, I'll enjoy it!